Since January 2011, you, the families of Greater Victoria School District, have contributed an amazing number of books to babies and preschoolers. 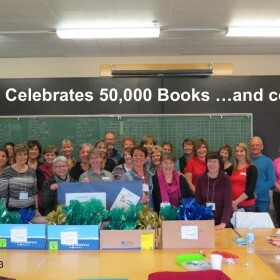 On October 23, volunteers counted the 50,000th book – an amazing gift that you continue to share with those who have few books. Check under your child’s bed and send a few more! Our Christmas demand swells and has already begun. Drop your books for babies and preschoolers in the pink bin in the main hallway.